The AutoDAB interface is designed to be completely hidden behind the dash in the car for a 'factory look'.It is controlled using the vehicle's steering wheel controls, and displays Digital Radio information on the original display. The AutoDAB has a voice prompt menu system, for added safety. 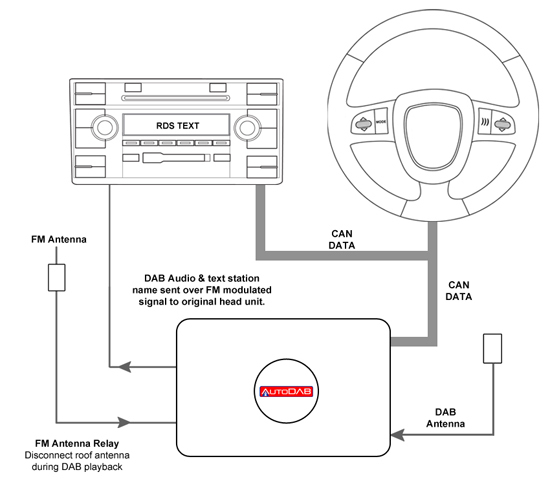 DAB stations can be selected from the vehicle’s steering wheel controls, allowing seamless DAB integration into your vehicle. Music is transmitted to your car radio via hard wired FM transmitter.